On Saturday, 24th March, I participated in the March for Our Lives in Seattle. I applaud the young people taking a stand for the implementation of common-sense gun regulations and wanted to show my support for this cause. The march was peaceful and there was a feeling of optimism and hope that this is a beginning for positive change. 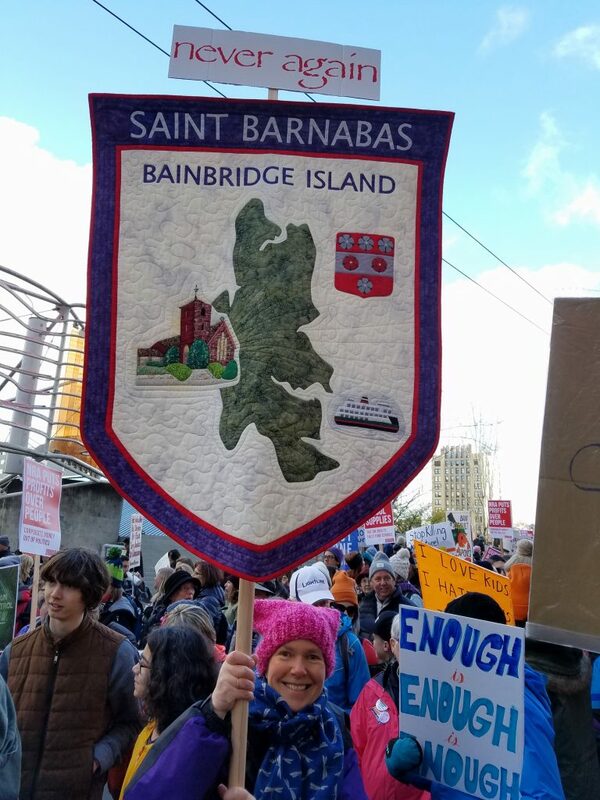 Several of our St. Barnabas Church parishioners participated along with other members of the Episcopal Diocese of Olympia including the Bishop. Here I am marching with our church banner, one of my rare applique quilts, made in 2000. The banner was much admired during the march. This is one of the more challenging quilts that I’ve made.. The Island, church, shield and lettering are done using a combination of hand, machine and fusible applique. The ferry boat was pieced and then the whole thing appliqued onto the background. We have a beautiful red brick church and I expressed my idea of our community extending beyond the parish by quilting lines radiating out from the lit up windows. The blue u-shaped piece in the border was cut from a large piece of fabric so that it could be made from just one piece. The quilt was machine quilted on my domestic machine. It has a split hanging sleeve on the back to accommodate the banner poles. I spent several weeks working every day on this banner just after my father passed away in the spring of 2000, and the experience was very soothing. I donated it to my church in his memory. He was an Anglican priest and a Canon of Newcastle Cathedral, (U.K.), and this seemed a fitting tribute to his ministry and my fond memories. This entry was posted in Quilts and tagged Quilt by Maggie Ball. Bookmark the permalink.